I just released my new book, G-d Versus Gods: Judaism in the Age of Idolatry (Mosaica Press, 2018). My book details the history of the struggle between idolatry/polytheism and Jewish Monotheism in Biblical times. It is broken up into two sections: The first section follows the narrative of the Bible and expands on the stories therein using traditional rabbinic sources, as well as more scholarly sources from Biblical Studies and ANE archaeology. The second section is an encyclopedia modeled after the Dictionary of Demons and Deities that has entries for every foreign deity mentioned in the Bible, with information again culled from classical Jewish sources, as well as academic ones. 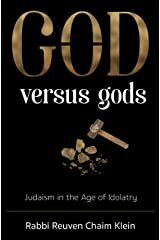 God versus Gods: Judaism in the Age of Idolatry seeks to understand the Bible's accounts of polytheism, follows its history, and focuses on the struggle between Jewish Monotheism and pagan/idolatrous cults in the Biblical period. An extended section is devoted to understanding the Talmudic concept concerning the paradigm shift which emptied the world of the Evil Inclination for Avodah Zarah, and its implications from a religious perspective. This unique work delves into the Bible's view of the history of idolatry, as well as the hermeneutical, philological, Kabbalistic, and Halachic approaches to this topic taken by various Rabbinic figures through the ages. The second part of this book consists of an encyclopedia that lists and elaborates upon ever foreign deity mentioned in the Bible. The author also compares and contrasts traditional Jewish views to those of modern-day academia (addressing archeology and philology of the Levant), offering proofs and difficulties to both approaches. As the old saying goes, "Two Jews, three opinions." In almost every chapter, more than one way of looking at the matter at hand is presented. In some cases, the differing opinions can be harmonized, but ultimately many matters remain subject to dispute. Hopefully, the mere knowledge of these sources will whet the reader's intellectual curiosity to learn more. Written by a brilliant young scholar, God versus Gods: Judaism in the Age of Idolatry is ground-breaking, intriguing, and remarkable. I wasn't aware that the posting of advertisements was deemed appropriate. FWIW, I find it tacky. Tacky or not, it's still an interested read.